Values are more than just words at Follett. In fact, they form the foundation of our relationships with customers, and each other. Founder C.W. Follett understood the importance that integrity, accountability, customers, each and every associate, innovation and teamwork plays in the success of a business. Although many years have gone by, these values remain unchanged. We constantly strive to be the provider of choice by putting customers first as well as delivering exemplary service and the highest quality products. This philosophy is reflected in the commitment of Follett's team members, who work tirelessly to make Follett a true partner in the educational process by living our core values every day. In fact, each summer, we celebrate those that go above and beyond by honoring quarterly Follett Values in Action award finalists as well as annual President's Award winners. 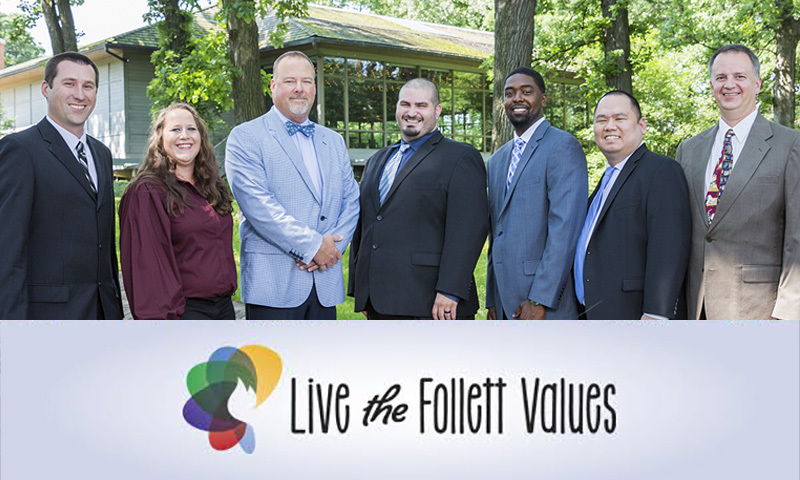 Click the photos below to learn more about the 2018 Follett Values in Action President's Award Winners and their accomplishments.